B.S., Electrical Engineering, Universidad Iberoamericana ("La Ibero"), Mexico City, Mexico in 1977. M.S. and Ph.D., Electrical Engineering, University of Hawaii at Manoa in 1980 and 1983, respectively. Dr. Garcia-Luna-Aceves is a Disinguished Professor of Computer Science and Engineering at UCSC, holds the Jack Baskin Endowed Chair of Computer Engineering, is CITRIS Campus Director for UCSC, and is a Principal Scientist at the Xerox Palo Alto Research Center (Xerox PARC). Prior to joining UCSC in 1993, he was a Center Director at SRI International in Menlo Park, California. He first joined SRI as an SRI International Fellow in 1982. He was a Visiting Professor at Sun Labs in Menlo Park, California in 1999, and was a Principal of Protocol Design for NOKIA from 1999 to 2003. He is past Chair of the Computer Engineering Department at UCSC. Dr. Garcia-Luna-Aceves was elected a Corresponding Member of the Mexican Academy of Sciences (Academia Mexicana de Ciencias) in 2013. He was elected an IEEE Fellow in 2006, an ACM Fellow in 2008, and a AAAS Fellow in 2010. He is the recipient of several awards for his research contributions, including: The IEEE MILCOM Technical Achievement Award in 2016 for his sustained contributions to military communications; the IEEE Computer Society Technical Achievement Award in 2011 for pioneering contributions to the theory and design of communication protocols for ad-hoc wireless networks; the IEEE Communications Society Ad Hoc and Sensor Networks Technical Committee (AHSN TC) Technical Recognition Award in 2012 for fundamental contributions to the theory and design of communication protocols for routing and channel access in ad-hoc wireless networks; and the SRI International Exceptional-Achievement Award in 1985 and 1989 for his work on multimedia communications and adaptive routing algorithms. He was appointed Visiting Professor at the Computing Research Center of the National Polytechnic Institute in Mexico City, Mexico, in 2012. He holds more than 60 U.S. patents and has published more than 500 papers on computer communication in journals, conferences, and books. He is the co-recipient of the IEEE Fred W. Ellersick 2008 MILCOM Award for Best Unclassified Paper. He is also the co-recipient of Best Paper Awards at the European Wireless Conference 2010, IEEE MASS 2008, SPECTS 2007, IFIP Networking 2007, and IEEE MASS 2005 conferences; and of the Best Student Paper Award at the 1998 IEEE International Conference on Systems, Man, and Cybernetics. Dr. Garcia-Luna-Aceves was General Chair of ACM MSWiM 2015. He has been Technical Program Chair of IEEE ICNC 2015 , General Chair of IEEE MASS 2014 , Program Chair of ADHOC-NOW 2009, General Chair of ACM MobiCom 2008 , the General Chair of the IEEE Second Annual IEEE Communications Society Conference on Sensor and Ad Hoc Communications and Networks (IEEE SECON 2005), Program Co-Chair of the ACM MobiHoc 2002 Conference and the ACM MobiCom 2000 Conference, Chair of the ACM SIG Multimedia, General Chair of the first ACM conference on multimedia: ACM MULTIMEDIA '93, Program Chair of the IEEE MULTIMEDIA '92 Workshop, General Chair of the ACM SIGCOMM '88 Symposium, and Program Chair of the ACM SIGCOMM '87 Workshop and the ACM SIGCOMM '86 Symposium. He helped start the ACM SIG on Multimedia and has served in the Steering Commitee for the ACM MobiHoc Conference Series. He has also been a member of the program and organizing committees of numerous IFIP 6.5, ACM, IEEE, and SPIE conferences on computer communication, networks, and distributed systems. He has been on the editorial boards of the IEEE/ACM Transactions on Networking, the ACM Multimedia Systems Journal, and the Journal of High Speed Networks. He has served in the IEEE Internet Technology Award Committee, the IEEE Richard W. Hamming Medal Committee, and the National Research Council Panel on Digitization and Communications Science of the Army Research Laboratory Technical Assessment Board. 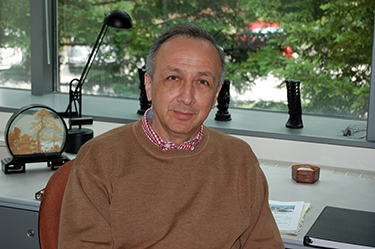 His current research interest is the analysis and design of algorithms and protocols for computer communication. At UCSC, he leads the Computer Communication Research Group (CCRG), which is home to many research projects that focus on internetworking, information-centric networks, wireless networks, the Internet of Things, and cyber-physical networks. He teaches courses in computer networks (CMPE 252A, CMPE152/CMPE252B, CMPE257), performance analysis (CMPE 107), and applied discrete mathematics (CMPE 16). He is very proud of the growing number of CCRG alumni, who include 42 Ph.D. graduates and 43 M.S. graduates. Short version of JJ's bio :-) DO NOT CLICK HERE!